Zayed Medal, UAE's top civilian honour, has been awarded to PM Modi for giving a boost to relations with the nation, the Crown Prince of Abu Dhabi, Mohamed bin Zayed Al Nahyan, said in a tweet. Zayed Medal to PM Modi, announced by Abu Dhabi Crown Prince Mohamed bin Zayed Al Nahyan. Prime Minister Narendra Modi was awarded Zayed Medal, the United Arab Emirates' highest civilian award, on Thursday as a mark of appreciation for his efforts to boost bilateral ties between the two nations. The Zayed Medal has earlier been awarded to Russian President Vladimir Putin, former US president George W Bush, former France president Nicolas Sarkozy, German Chancellor Angela Markel, Queen Elizabeth II from the United Kingdom and Chinese President Xi Jinping. 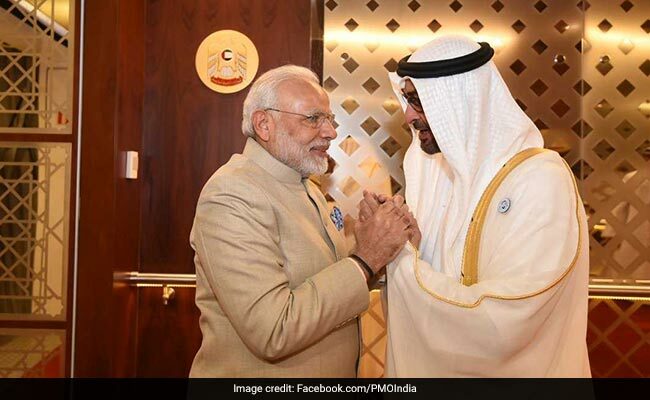 In a tweet, the Crown Prince of Abu Dhabi, Mohamed bin Zayed Al Nahyan, said, "We have historical and comprehensive strategic ties with India, reinforced by the pivotal role of my dear friend, Prime Minister Narendra Modi, who gave these relations a big boost." PM Modi tweeted to say he accepts the award with "utmost humility". Thank you, Your Highness Mohamed bin Zayed Al Nahyan. I accept this honour with utmost humility. "The State visit of the Prime Minister (Modi) to UAE in February last year helped in sustaining the momentum generated by earlier visits of Crown Prince in 2017 and 2016 and that of PM in 2015," the Ministry of External Affairs said. External Affairs Ministry Spokesperson Raveesh Kumar said India "greatly" appreciated this honour conferred on PM Modi. "This singular honour is in recognition of the efforts of the government under the Prime Minister's leadership to develop the strategic partnership between India and the UAE," Mr Kumar said. India and UAE share warm relations that were strengthened after PM Modi paid a visit to the nation in 2015. PM Modi visited the UAE for the second time as Prime Minister in February last year and held wide-ranging talks with the Crown Prince. After their talks, the two sides signed five agreements related to energy sector, railways, manpower and financial services. The Crown Prince had also visited India in 2017 as the chief guest for Republic Day celebrations in New Delhi. In February, the Crown Prince telephoned PM Modi and his Pakistani counterpart Imran Khan as part of his efforts to de-escalate India-Pak tensions following the Pulwama terror attack claimed by the Pakistan-based Jaish-e-Mohammed terror group in which 40 CRPF personnel were killed. Congratulatory messages poured in for the Prime Minister on receiving UAE's top civilian honour. Union Ministers Ravi Shankar Prasad, Sushma Swaraj, former Madhya Pradesh Chief Minister Shivraj Singh Chouhan and several other leaders tweeted about India's "best ever relations with the Islamic world". "I am extremely happy to welcome the announcement of Order of Zayed for a great son of India Prime Minister Narendra Modi by His Highness Mohamed Bin Zayed," Foreign Minister Sushma Swaraj tweeted. She said the prestigious award was given to PM Modi in recognition of his "stellar role" in ushering in a new era of strategic partnership with the UAE and the "best ever" relations with the Islamic world. I am extremely happy to welcome the announcement of Order of Zayed for a great son of India Prime Minister @narendramodi by His Highness @MohamedBinZayed. A huge moment of pride for Indian citizens as Prime Minister @narendramodi has been conferred with the prestigious #ZayedMedal by the President of UAE. Under the visionary leadership of PM, unprecedented efforts have been made to establish strategic ties with the Gulf countries. Indeed a very proud moment for India as UAE confers Zayed Medal to our popular PM @narendramodi Ji. The award recognises the stellar role played by PM in forging deeper ties with UAE and the larger Islamic world. On behalf of the people of UP, I Congratulate our Hon. PM Shri @narendramodi Ji on being conferred with Zayed Medal, highest civilian honor by UAE government for his international leadership & joint strategic cooperation between the two countries. We Indians are proud of our PM. The UAE accounts for 8 per cent of India's oil imports and is the fifth largest supplier of crude oil to India. The country is also a part of the International Solar Alliance (ISA), which is headquartered in Gurgaon in India. India-UAE trade stood at about USD 50 billion in 2017, making India the second largest trading partner of UAE, while UAE is India's third largest trading partner (after China and the US). Moreover, UAE is India's second largest export destination, accounting for over USD 31 billion for the year 2016-17.